Vietnamese beef noodle pho is an easy soup to fall in love with. Those chewy noodles, that savory broth, the tender slices of beef — all those crunchy, spicy, herby garnishes we get to toss on top. After a walking day, enjoy a bowl of Pho. It would be great. Bún chả is a Vietnamese dish of grilled pork and noodle, which is thought to have originated from Hanoi, Vietnam. Bun cha is one of 5 most delicious gourmet cuisine in Hanoi. 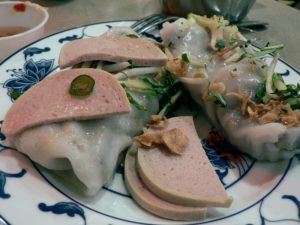 One of the best Vietnamese breakfast dishes – Banh Cuon. Simple, healthy and absolutely delicious, this is a must try. Restaurant recommendations inside! Banh Xeo Vietnamese pancakes are an essential must-try in the world of Vietnamese cuisine. Enjoy this dish should be on your things to do list in Saigon. Gỏi cuốn or Vietnamese spring roll, is a Vietnamese dish traditionally consisting of pork, prawn, vegetables, bún (rice vermicelli), and other ingredients wrapped in Vietnamese bánh tráng. This is a dish a great treat for you to try. Mixture Rice Paper (Bánh Tráng Trộn), one of best street food so far in Vietnam, especially in the South. It is also appropriate with every ages, this dish attract kids and people around Vietnam. If you’re planning on traveling to Vietnam, the one sandwich you will hear about and will not want to miss is the Bánh Mì. 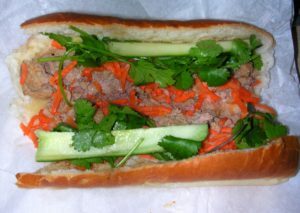 This famous Vietnamese sandwich has been consistently ranked as one of the world’s best sandwich. If you’re in Hoi An, you have to try Mì Quảng. This delicious noodle dish is famous in the Quảng Nam Province (hence the name Mì Quảng, or “Quang noodles”). 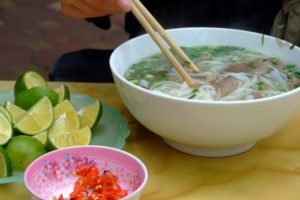 You can find it in other cities such as Saigon, but if you’re coming to Central Vietnam we suggest you hold out on trying Mì Quảng til you get here. In the region, it is one of the most popular and nationally recognized food items. Eggs with your coffee? In Vietnam — a culture that loves caffeine and locals put eggs in their coffee. 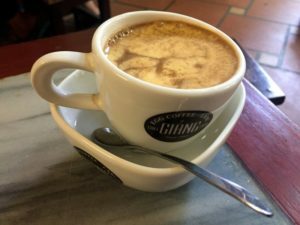 And if you want to try the unique egg coffee from Vietnam, Giang Cafe is definitely the place to go in Hanoi.